Score your white cardstock to 5.25 x7.25" using a bone folder to get a nice crease. Take your card panel from the sheet of patterned paper from the Sweet as Honey collection. Adhere to the front to a piece of kraft color paper and then adhere it to the scored white card base. Instructions: Now take your hybrid ink and stamp the bees along with your bee house onto the watercolor paper. You can heat set if you would like but there is no need. 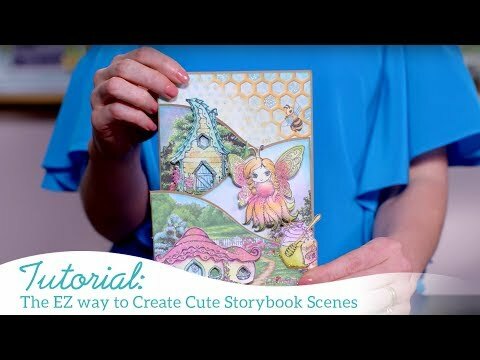 Next color your bee house using the zig clean color pens in coordinating colors and then color your bees. Once done use the coordinating die set and die cut all the elements and adhere to your card front to complete the look.